Despite a strong second half performance, the Milwaukee Panthers (3-2-0) were unable to overcome two early first half goals by #22 George Mason (4-0-0), falling to the Patriots 2-0 in the Capital Cup tournament Friday evening. Only 32 seconds into the contest Patriots’ leading scorer, Timi Mulgrew, took advantage of a defensive miscue to find the back of the net, giving George Mason the 1-0 lead. Not even seven minutes later, the Patriots were able to add on, increasing their lead to two. 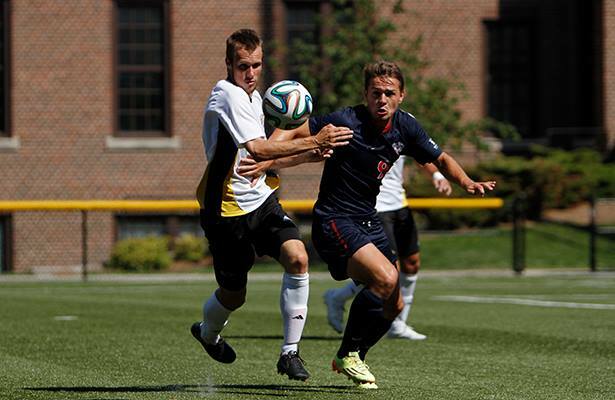 Mason Herstek was able to get it past Panthers’ goalkeeper Agustin Rey with Mulgrew recording an assist. In the Patriots’ three previous games, they have averaged over three goals per game. Defensively the Panthers had to play at a high level, and allowing two goals not even seven minutes into the game, gave George Mason all the momentum. After only one shot for the Panthers in the first half compared to seven for the Patriots, Milwaukee came out with more energy and aggression in the final 45 minutes of play. In the second half the Panthers were able to record six shots, with senior Laurie Bell tallying three of them. In the 62nd minute, Zach Stevenson was able to create some space, putting the first shot on goal for the Panthers in the game, but George Mason’s goalkeeper, Steffen Kraus, was able to stop it from going in. Then in the 89th minutes, Bell received the ball and headed it towards the goal, but once again the Kraus was able to keep Milwaukee off the board. Kraus may only be a sophomore, but in only a year he has developed into a tremendous collegiate goalie. After being named an All-American a season ago, Kraus has continued his high level of play this year, only allowing one goal in the Patriots’ four games. Anytime you go up against a talented defense with a solid player in net, you have to take advantage of every opportunity you get, while playing excellent defense. Offensively, this is close to what was expected for the Panthers leading up to the game against an outstanding defense in George Mason, but defensively Milwaukee had to be better. Allowing a goal only 32 seconds into the game is inexcusable, and was the difference in the game’s momentum the rest of the way. This game was a learning experience for the Panthers, as this was their toughest opponent to date. Milwaukee definitely has some things they still need to work on before Horizon League play begins on September 27 against Cleveland State. But don’t worry; the Panthers are a talented team led by an outstanding coach. They will get these little things fixed, and once they do, they will be dangerous. Milwaukee will look to return to their winning ways when they go head to head against #19 American in their final game in the Capital Cup tournament on Sunday.